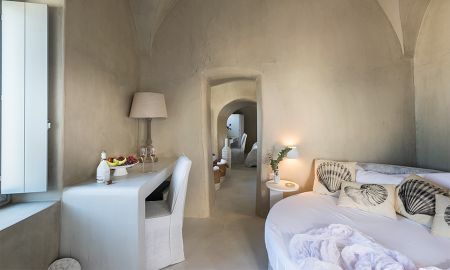 Executive suites are elegant decorated private cave suites with the unique Cycladic character and charm. The suites have a spacious bedroom with a double bed and a bathroom designed and equipped with all modern amenities offering an unforgettable experience. 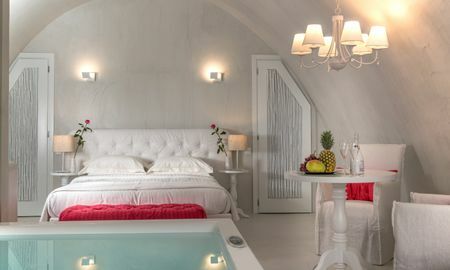 Honeymoon suite is elegant decorated private suite with modern amenities and the unique Cycladic character and charm. This suite comprises a spacious bedroom and bathroom with elegant furnishings with an indoor luxury private Jacuzzi. This suite has views of the Caldera by the large window of the bedroom, so the guests can enjoy the view by their indoor Jacuzzi. 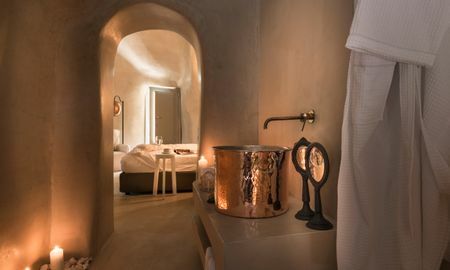 Charmy suite decorated with Cycladic character. The suite comprises a spacious bedroom and bathroom with elegant furnishings. It offers an outside heated Jacuzzi, at the back yard of the property. Sophisticated style embraces the bedroom and the seating corner, while the terrace welcomes you to a panoramic view of the Caldera and Aegean Sea. Indulge and spoil yourself in the enchanting Grand suite. An elegantly furnished room, a double bed & a round bed, with a 2 bathrooms with rain shower. 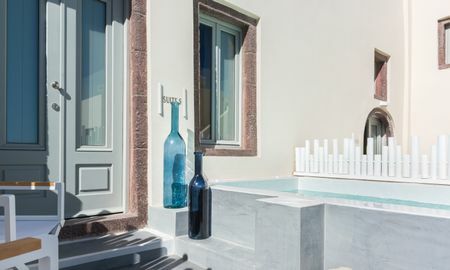 Enjoy a romantic bath in the private outdoor heated plunge pool, while admire the Aegean Sea and the Caldera. Senior Suites are differently decorated suites, always according to the unique Cycladic charm. The suites are spacious with elegant furnishings, a double bed, a sofa and comprise a spacious bathroom with all modern amenities. All suites have an outdoor heated plunge pool, at the shared terrace for a unique experience even for the more demanding travelers. 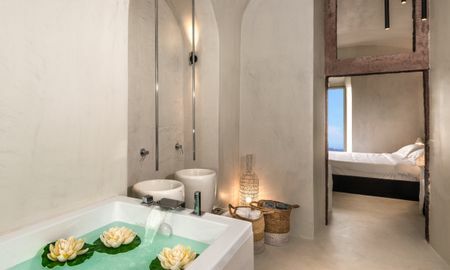 The 4-star Mythical Blue Luxury Suites is a highly aesthetic residence of individual style and unique elegance with respect to the formation of the area and the monumental character of the complex. Featuring a breathtaking panoramic view of the historic village, the hotel offers an unrivalled service from one of the highest points of the Caldera, perfect for honeymooners and a vacation escape. All guestrooms and suites have been designed in such a way that visitors can enjoy luxury and comfort in a tranquil setting. Decorated in Cycladic character and charm, the spacious abodes are equipped with all the necessary deluxe amenities for the sophisticated traveller. Selected accommodation are outfitted with elegant furnishings; a sofa; a balcony with stunning views of the Caldera and the Aegean Sea; and an indoor or outdoor Jacuzzi. On the island's finest balcony, kick-start the day with a rich buffet breakfast. The Yellow Sea Restaurant boasts gastronomy based on Mediterranean cuisine, French techniques and the freshest local products. Certain to elevate a pleasant mood, the All Day Cocktail Bar 1855 AD is famous for its wonderful refreshments and bio products served on the excellent veranda. Its rich wine cellar, combined with the island's history of wine, offers a variety of alternative suggestions, marrying food and wine on this unique island. The enchanting Spa & Wellness welcomes all into a world of relaxation and invigoration. Whether opting for modern or local expertise, treatments are performed by the healing hands of the professional therapists in an outdoor environment. Additionally, the property includes an outdoor pool, while a number of activities are offered in the local area, such as horse riding, snorkelling and windsurfing. 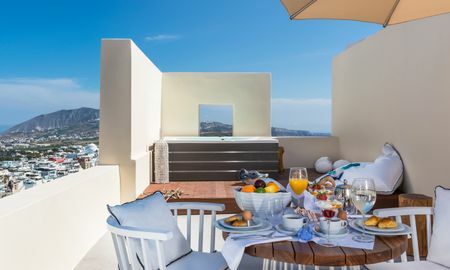 Mythical Blue Luxury Suites is situated in the heart of Fira, in the centre of Santorini and is surrounded by well-known landmarks such as museums, restaurants and shops with local transportation nearby. The Mythical Blue Luxury Suites is located 10 km from International Airport of Santorini and Athinios Port.